everything excelent. Friendly persons nice and clean room and pool. Everthing met n over exceeded my stay n expectations. Very easy and close to the airport! 24 check in, clean and helpful staff! 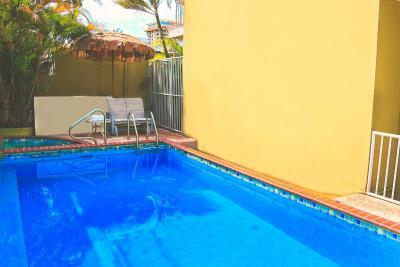 The walking distance to the beach and main streets. The staff was friendly and accommodating. There was pastries, hard boiled eggs, bagels and coffee in the morning. While eating breakfast the owners were meeting with what appeared to be an interior designer which gave us the indication that there is plans to update. There was a bridge next to the hotel that went over the busy highway that gave access to the beach. Thank You Ville Verde! This was my first time in Puerto Rico and I didn’t know what to expect but I am so grateful to you and your staff for making my stay celebrating my birthday so wonderful. Thank you for answering my emails, for your recommendations, and again for your hospitality. You are a small property and though you can’t compete with the larger chains, you have a Big heart. I also enjoyed that you were minutes to the beach even though I had to climb stairs to get there. It was great excercise! I also appreciated my hot showers and sense of security. And your speaking English was great!!! Thank You!!! Value and location. Room was surprisingly spacious. Friendly staff. Nothing ,the first room the ac unit was dripping water on the tv and the carpet .the 2nd room the bathroom door knob was broken ,mold on the bath tub . The iron was very dirty and burn my blouse. The continental breakfast was okay, the bed and room was comfortable, and there was a small fridge and a small microwave. there is a spanish bakery down the block which is also a restaurant, and there is Burger King right across the street. The airport is about a ten minute ride from the hotel, this I found very convenient. I would definitely stay here again if I am in San Juan. 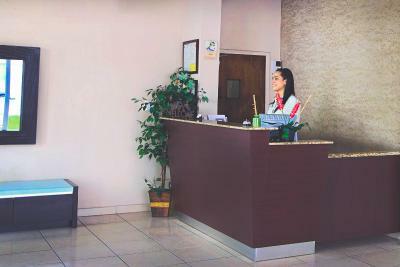 Villa Verde Inn This rating is a reflection of how the property compares to the industry standard when it comes to price, facilities and services available. It's based on a self-evaluation by the property. Use this rating to help choose your stay! 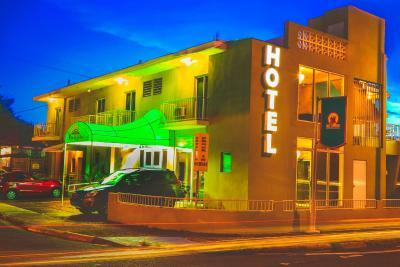 Across from the beautiful sands of Isla Verde Beach, this Carolina inn features an outdoor pool. Free Wi-Fi and a daily continental breakfast are also provided. 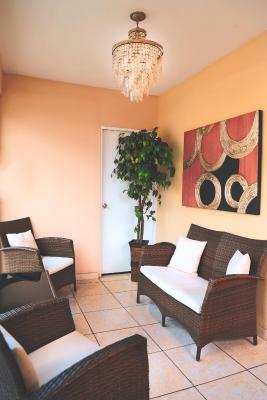 Cable TV, a microwave and a fridge are found in each bright room at the Villa Verde Inn. A balcony area and a work desk are also included. Shuttle service to Isla Verde Avenue and the public beach is available during the day. Access to a nearby tennis court and a gym is also available. The Luis Munoz Marin International Airport is 5 minutes from the hotel. The Puerto Rico Museum of Art is less than 3 miles away. When would you like to stay at Villa Verde Inn? Has a private balcony, microwave and refrigerator. Has a private balcony, microwave and refrigerator. Interconnecting rooms are available. House Rules Villa Verde Inn takes special requests – add in the next step! Villa Verde Inn accepts these cards and reserves the right to temporarily hold an amount prior to arrival. Please note if you need to arrive after 4:00 AM, inform the hotel as otherwise the reservation will be charged with a No-Show Fee and the room may not be available. There not hot water and the outlight all time was on. There was no hot water my whole stay there. It was very hostel like hotel. The pictures on the website made the hotel look nice, but was way off from reality. The room was a disappointment and way overpriced for what it was in reality! I was expecting a nice room for the price I paid. The door to the balcony in our room wouldn't close, so we had light, heat, and loud sounds from the highway coming in. Our toilet dripped all night. The front desk staff when we checked out at 4:30am was asleep at the desk and we had to wake him up to check out. The location was close to the airport. The daytime front desk staff was really friendly and accommodating. Rooms were clean. Came back from shopping n the housekeeper left the room door open. The front desk agent apologized n did something special to show that she was really sorry that happened. The price is ok. The location is right on the highway. Could not close my eyes bc of traffic. Puerto rican drivers can be loud with their engines and big mufflers. The room has mold in the bathroom. The smell of the mold was strong. The front door also had mold. I didn’t say anything to them bc i only booked for two nights. But i will not go back again. The continental breakfast is bread, butter croissant and coffee, boiled eggs. Everything was fine,except for the fact of really been so close to the main highway. The noise from all the traffic. Next time hopefully I can get a room further away from the highway. Everything; the location was okay. The room was located outside in the back of the building. The pool area was padlocked by our room which meant if we wanted to use the pool we would have to walk outside around the building through the parking lot to use the pool area. Other rooms outside seemed to be vacant and items stored on porches made it appear run down. Our uber driver asked how long we were staying at this location.. He indicated there were better areas to stay. We didn't feel unsafe, but it was only one night.